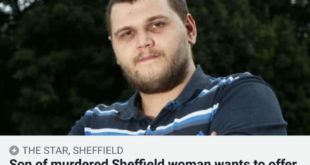 A teenager has started a website to hunt the killer of his mum who was murdered 11 years ago. 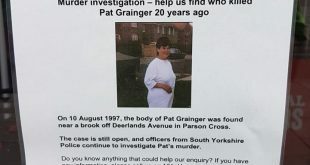 Patricia Grainger was 25 when she was found dead near her home in Parson Cross, Sheffield, on August 10, 1997. She had been strangled, stabbed and sexually assaulted. Her body was found in a brook covered by a mattress. 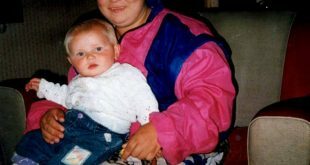 The crime has never been solved and now her son, Daniel, 16, has renewed the hunt for her killer. He has launched a website, www.whokilledmymum.com, which he hopes will lead to a breakthrough. The website includes photos, news articles and a blog from Daniel, who was just five when he lost his mother. He said he remembers little from the day his mother’s body was found, apart from “crying and seeing the police everywhere on the street”. Daniel hopes advances in technology and DNA testing will help finally bring the culprit to justice. He added: “My mum was a lovely woman who would not hurt a fly. She was friendly and would talk to anyone who would talk to her. “There is no known reason why someone would do what they did. Anyone with information should call South Yorks police on 0114 220 2020 or Crimestoppers anonymously on 0800 555 111.